I can’t tell you how infuriated it makes me to see food containers discarded in our beautiful countryside, but it’s all too common. And of course I wouldn’t think for a second that I’m the only person to feel this way, I’m sure every one of you reading this reacts in the same way. I can also say hand on heart that I have never ever ever dumped rubbish anywhere other than in a bin. However, I do, of course, use plastic. I do my best to recycle it as much as possible, but I am one of those consumers of over packaged products. I think we are, as a society, beginning to realise the awful impact this has had and is having on our planet, and slowly changes are happening. We’ve a long way to go though and this is why books like Captain Green and the Plastic Scene are so important. This book is written by Evelyn Bookless, illustrated by Danny Deeptown and published by Marshall Cavendish Children. 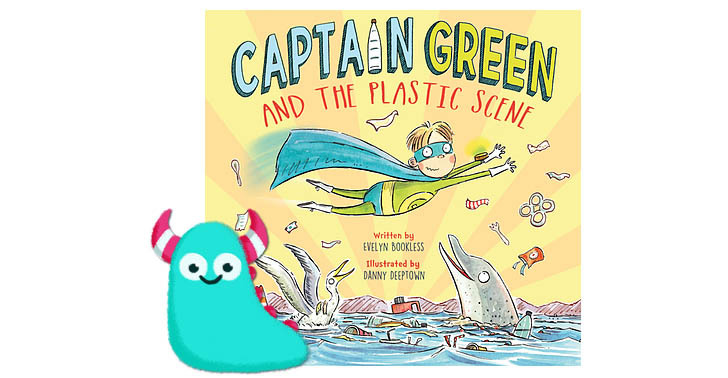 Captain Green is a practicing superhero wanting to clean up the planet. But the more he tries to clean up, the more he realises the true extent of the problem. We are taken through scenarios that any of us on social media will be familiar with, terribly sad scenes of sea creatures caught in fishing nets or swimming among plastic. 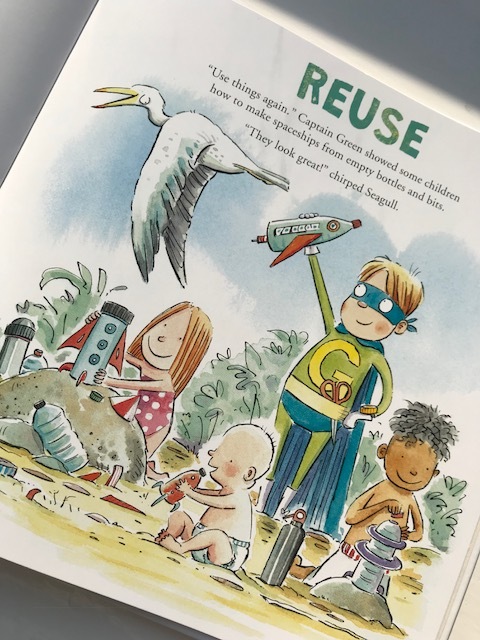 Captain Green does what he can to help, but he knows now that this is not a job he can do on his own, everyone must help keep our planet clean by following the three Rs, Reduce, Reuse and Recycle. By educating everyone, we can work together to make the planet cleaner and safer. I really loved this story, it’s been written beautifully by Evelyn Bookless, cleverly plotted to show the damage that our overuse and dumping of rubbish is causing through real examples. Then, via Captain Green’s explanations, what must be done to combat the problem. There’s enough text to make the story a good length for older children but not so much it goes over the heads of little ones, a really nice balance. 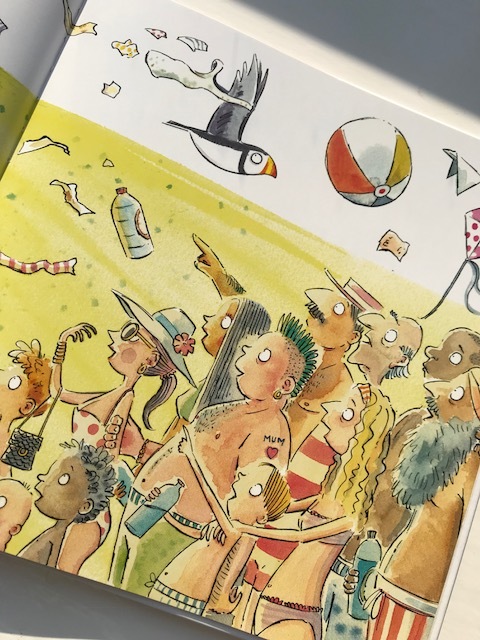 Danny Deeptown’s illustrations are bright and colourful with pops of personality in the creatures and the humans, and lots of brilliantly little details, giving the pictures interest and entertainment value without detracting too much from the importance of the story. The use of typography and illustration combined really hammers home the point of the book in a brilliant way. 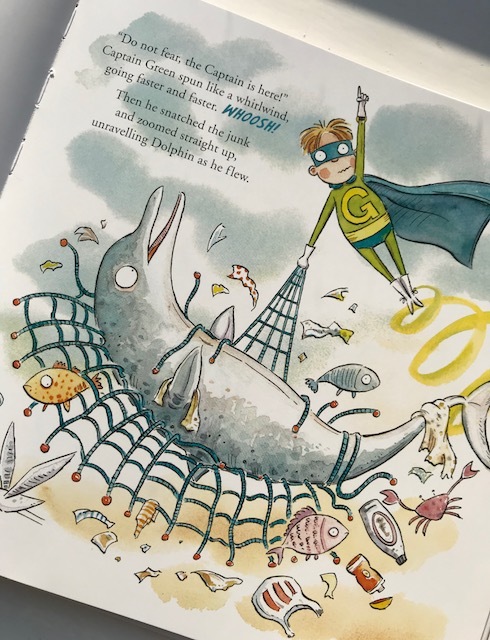 Captain Green and the Plastic Scene is a perfect book to show every child how they can be superhuman by helping to clean up our planet. A first introduction to recycling and cleanliness for children and a wonderful companion book in schools when teaching about this subject. There are so many uses and directions you could take this story in, it’s an absolute gem. 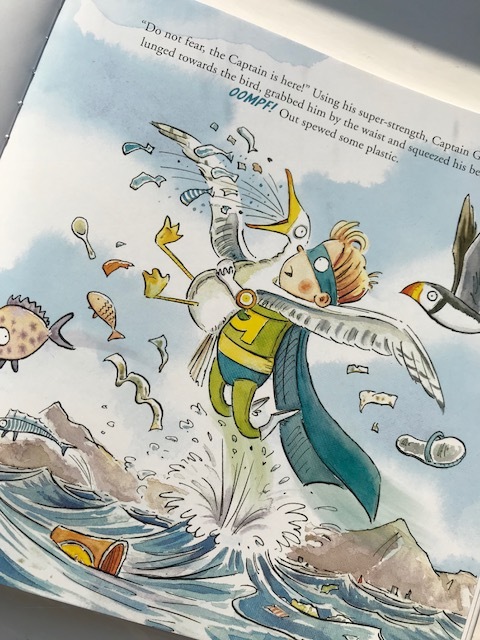 It’s not worthy, or forced, it’s a nicely written and illustrated important tale of what WE should all be doing to make this planet better for everyone and this example should be set as soon as possible. What a perfect book to set it with. Captain Green and the Plastic Scene is now available from all good bookshops and libraries. Thank you to Evelyn for sending me a copy of her book and thank you for reading this environmentally friendly Book Monster review.